Jewelry designers create original jewelry designs for one-of-a-kind masterpieces and signature collections. The designers own copyrights to all of their "creative works of authorship." 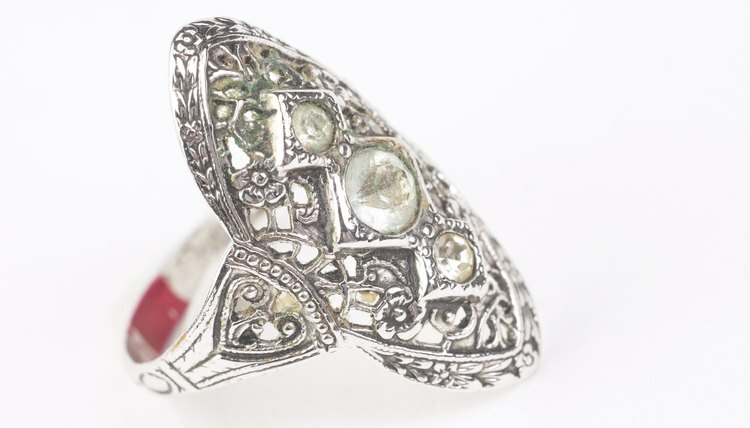 Copyright protection covers jewelry designs as "pictorial, graphic and sculptural works." The designer owns basic copyrights in the jewelry design as soon as it is fixed in a tangible form such as a detailed drawing, the metal cast or finished piece of jewelry. The designer can register his work with the federal government for broader copyright protection. U.S. patent law might cover more technical designs. A jewelry designer automatically secures "common law" copyright protection when he creates a jewelry design and documents it in a tangible form. The tangible form does not need to meet any formal requirements: It can be as simple as a rough sketch on a piece of scratch paper, but must be more than an idea or concept. Common law is the system of law that originated in England, as unwritten law. Under common law, it is traditionally accepted that a creative author owns copyrights in his own creations. Therefore, a jewelry designer owns the copyrights in his original jewelry designs. However, if the jewelry designer works for a jewelry company, the designs created within the scope of his employment belong to the employer, so the company would hold the copyrights in the designs. Not all jewelry designs qualify for protection under copyright law. The designs must be original. A design requires only a slight amount of creative inspiration to qualify as original. A simple strand of pearls, a pair of diamond-studded earrings or a traditional gold wedding band will not qualify for copyright protection if they lack the requisite originality in design. The jewelry design must be original and not generic in form. As an example, the Hope Diamond set in its unique design might qualify for copyright protection opposed to an iconic diamond wedding ring. The Hope Diamond is considered one-of-a-kind because of its size and cut. However, it also contains a slight amount of creativity in Its design, with smaller cut diamonds around its edge.The design might qualify for a copyright, but not the actual piece of jewelry itself. A jewelry design may qualify for copyright protection under the pictorial, graphic and sculptural work sub-category. Jewelry fits into this type of work because the design may generally be represented as pictures, graphic designs or a three-dimensional sculpture. The U.S. Copyright Office accepts federal copyright registration applications for jewelry designs under the broader category of visual arts. Online registration through the electronic Copyright Office requires the online application to be completed. Alternatively, paper applications for visual arts work require form VA or short form VA to be completed and mailed to the Copyright Office. The copyright registration application for the jewelry design must meet specific requirements for visual arts work. In addition to a completed application and filing fees, the registration process requires the copyright owner to make a deposit of the visual arts work. For jewelry designs, the deposit can be a two-dimensional representation of the three-dimensional jewelry instead of the physical jewelry. As an exception, a jewelry item cast in common metal may be submitted, if less than 4 inches in all dimensions. For jewelry, the deposit can be photographs that capture every copyrightable element of the jewelry, including the metal, stone and setting. The photos must be larger, color images on archival-quality paper. The dimensions of the identifying images should be between 3 by 3 inches and 8 by 10. No images larger than 9 by 12 will be accepted. Jewelry Insurance Issues: One of a Kind -- or Not?